Like most boys his age, 13-year-old Jullien Caillol (Jules) is an energetic and active kid. For the last couple of years, he has actively attended twice-weekly training sessions at the UFIT Youth Academy. This is where he trains with coaches Tom and Joe, both highly-qualified youth strength and conditioning coaches, to improve his sports performance and overall fitness and health. The group training sessions are structured to be fun yet challenging, it is one of the activities Jules really looks forward to in the week. We speak to Jules and his mum Kerry to find out what keeps him coming back to the programme! Jules training with the battle ropes at the training. What sports do you play and how long have you done that for? I play many sports, but rugby is my favourite – it is the sport that I am competitive in. I’ve been the captain of the Under-14 Singapore Cricket Club (SCC) Team for the last several years. I also represent my school team at the United World College. On the side I also enjoy parkour and basketball. Tell us about what the training is like at the Youth Academy? We do a lot of strength and conditioning work which helps me build the explosive power essential for all the sports I love. My overall strength and technical abilities have grown, and I’ve also seen great improvements in my rugby performance. I like the training atmosphere and the discipline it teaches me. The coaches are amazing, and I love the challenge of training to achieve the next level – I have now reached the Gold level! You have also participated in the UFIT kids’ Rugby Development Camp. What have you learnt and what do you like about the camp? The rugby camp is FUN! It helps me to break down my game, and enhance my technical knowledge and skills to excel in the sport. We get to work with some pretty amazing guest coaches at the camp, which is always exciting as we are getting world-class tips from pro players. I’ve also learned a lot about pre-game nutrition. Jules got to meet and train with one of England's top pro rugby player Dan Norton at the UFIT Rugby Development Camp. How have the UFIT coaches helped you and what are they like to train with? What is it about them that motivates you? The UFIT coaches are very approachable, and they make learning really fun! It didn’t matter how big or small our achievements, they are always super supportive and enthusiastic, which is very motivating for us. I can feel their genuine passion in training us, which makes me want to work harder and achieve more. The coaches are a real inspiration for me, they teach me to be focused and disciplined in reaching my goals. How do you fit all this sports training in your days along with school, homework, family time, and playtime? I get out of bed early! And over to Jules’ mum - Kerry. What changes do you see in Jules after training at the Youth Academy and kids’ camps? Over the last few years that Jules has been attending the Youth Academy, it has become something that he loves and prioritize his time for! He’s learnt that he feels better when he exercises. The training not just improved his physical health, but also helped in his mental ability to cope with the stress in school. It is a healthy outlet for him to release stress and reenergize. Jules with his proud mum, Kerry. Jules is now better able to focus both in school work and in his sports training. He has also met many good friends and positive role models in his teammates and coaches. As a parent, I think the confidence and focus developed from sports training is the best gift to give my child! Frazer’s passion in life has always been sports – and how to win them! After being coached at the Bath Rugby’s youth academy by ex-England scrum half and captain Richard Hill, to captaining his university's first XV under the tutelage of Welsh National Academy coaching manager Allan Lewis, Frazer went on to win caps for Scotland Rugby in the Under 18s, 19s and 20s as well as playing for Gloucester Rugby at ‘A League’ level. It is this experience and background that motivated him to create the UFIT Sports Education division where he leads a talented team, each a specialist in their own sport, to provide continued professional development to other professionals in the sporting field. Since coming to Singapore, Frazer has also coached the Wanderers Rugby team, and is now the national head coach of the Singapore Men’s Rugby. 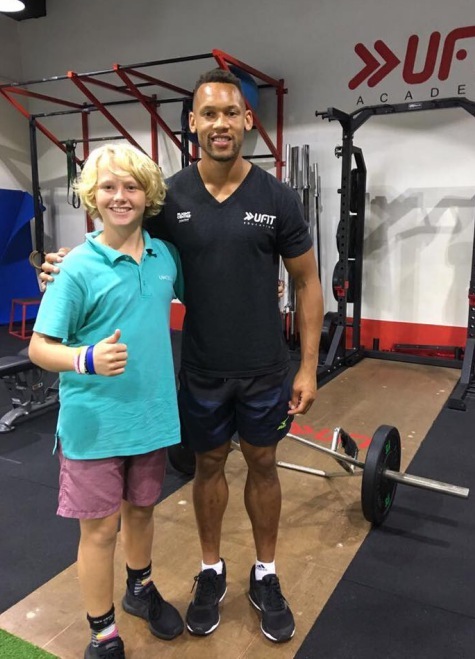 Joe is an Masters level UKSCA Accredited Strength and Conditioning Coach, with a wealth of experience working with athletes of all ages and standards from professional athletes to 6-9 year-old youth athletes. Joe’s training style focuses on the underpinning quality of strength and movement quality to assist performance of sporting goals, body composition, and general health and well-being. He places strong emphasis on evidence-based programming, training smart and getting the basics right. Joe believes in coaching with intelligence, training with intent and keeping things simple. Tom holds a masters degree in Sports Strength and Conditioning and is accredited through the NSCA as a strength and conditioning specialist. He has worked in the industry for the last 7 years as a personal trainer and strength coach, working with a wide range of people from professional athletes to people who are just embarking on their fitness journey. Tom’s methods have helped hundreds of people achieve their fitness goals. Tom doesn’t believe in gimmicks. His style is based on training hard but training smart. He believes in building a solid training program, which includes mastering the basic movements, whilst adapting and progressing the program to support your goals.